Courses must be approved by a state or national organization empowered to accredit nursing continuing education. 64B5-12.020 Courses Required of Licensees for Renewal and Reactivation. Licensed dentists and dental hygienists are required to complete the following continuing education during each license renewal biennium. (1) Training in cardiopulmonary resuscitation (CPR) at the basic support level, including one-rescuer and two-rescuer CPR for adults, children, and infants; the relief of foreign body airway obstructions for adults, children, and infants; the use of an automatic external defibrillator (AED); and the use of ambu-bags resulting in certification or recertification by the American Heart Association, the American Red Cross or an entity with equivalent requirements. 28 hours of CME are required. They can be ACPE or Board Approved. 10 of the 28 general hours must be live. Pharmacists who wish to provide immunizations must take a Board approved immunization training program. The program must be at least 20 hours and include a review of immunization laws and Cardiopulmonary Resuscitation (CPR) training. The statewide association must be accredited to provide American Medical Association Physician’s Recognition Award (AMA PRA), Category I Continuing Medical Education (CME). 64J-1.022 Cardiopulmonary and Advanced Cardiac Life Support Courses. 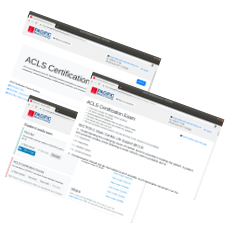 (1) Cardiopulmonary resuscitation (CPR) or advanced cardiac life support (ACLS) courses which have been accredited by the Commission on Accreditation of Pre-Hospital Continuing Education (CAPCE) are defined as equivalent to CPR or ACLS courses conducted by the American Heart Association or American Red Cross. 64E-28.003 Licensure Requirements for a Tattoo Artist. (b) A copy of the certificate of training proving completion of a department approved course on blood-borne pathogens and communicable diseases with having achieved a minimum score of seventy percent (70%) on the course examination. Total number of locations: 134. These locations CAN provide American Heart Association-branded provider cards if needed. It is not uncommon for Lauren Bertke to assist in hands-only CPR through the phone. In the early Saturday morning, the public communications officer received a call for help from Vince Hogan, who is trying to revive his father from a seizure. Mercer Hogan had already stopped breathing and the 29-year-old son was frantic to get a pulse. He applied chest compressions according to the instructions of the 911 dispatcher. The paramedics arrived just in time to take over the CPR attempts and wheel the older Hogan to a hospital, where it was found out he suffered from a heart attack. The father is truly proud of his son and grateful for his efforts to keep him alive. Surrounded by emergency crews because of his sister who is a paramedic, Levi Buttrill is used to hearing survival stories, but he did not expect he’ll get one of his own. During one working day, he was electrocuted in the construction site. According to his co-workers, he stopped breathing as was has brought down to a safe zone. His best friend immediately called 911 and performed chest compressions according to the instructions of the dispatcher. Thankfully, an Ocean City fire chief took over the CPR until paramedics arrived. If not for his friends’ efforts, Buttrill could possibly suffer from brain damage, or worse, death. A woman was just sitting down for dinner while visiting New York City when her mother suddenly saw her seizing. Two young men went to her aid. They searched for a pulse, but found none. They began to do chest compressions. An emergency management team was hailed and when they arrived, she was already revived. They immediately wheeled her off to the hospital where she’d be able to get more thorough observation and care. She is now a survivor of a cardiac arrest and she stresses the importance of learning CPR so that people would be able to help others whenever such an occurrence takes root in other people’s lives. For firefighter David Burnett, being on vacation doesn’t mean not helping when lives are in danger. He was out in the backyard for a cookout when they heard screams from the neighboring house. Even if Burnett didn’t hear them at first, a friend told him about the noise and he immediately rushed over to help. A six-foot fence didn’t stand in the way, as he easily got over it and found a 3-year-old girl next to the pool, blue and unconscious. Burnett immediately administered CPR and asked the girl’s father to call 911. The girl was able to breathe normally after being resuscitated and cried all the way to the hospital. Her recovery was fast, thanks to the holiday help extended by the firefighter. It was all in a day’s work for officer Karleigh Smoak when she received notice of Juan Jose San Juan of 66 years old found unconscious by his wife. Officer Smoak quickly arrived to the house and after examining the body she began doing CPR untl EMS arrived to the scene and took over. Jack Menzies managed to save an elderly's life thanks to his basic CPR knowledge and for remembering the comedic series "Scrubs". It all happened at a pensacola neighborhood. Greg Yost was driving with his wife when he suddenly lost consciousness. Greg's wife Tony Yost got out of the car and started screaming for help. Luckily for them, Jack was passing nearby with his aunt. The heroic teenager jumped to help by remembering the chest compressions done on Scrubs series and singing "Staying Alive" song in his mind, he began giving CPR assistance until the ambulance arrive to transport the elderly to a nearby hospital.